Heat oven to 350°F. Stir together goat cheese and cream cheese until smooth and well blended. Spread into a lightly greased oven-safe shallow dish; set aside. In a saucepan over medium high heat add olive oil. Add onion, poblano pepper and sauté until tender. Stir in garlic and continue to sauté for 1 minute. Reduce heat and add cumin, pepper flakes, salt, pepper and tomatoes. Simmer for 10 minutes, until mixture thickens, remove from heat and adjust seasonings to taste. Top goat cheese mixture with tomato and pepper mixture and bake for 10 minutes or until thoroughly heated. Serve warm with vegetables, sliced bread or with tortilla chips. Plan ahead: prepare tomato mixture, allow to cool and store in the fridge for up to 3 days. 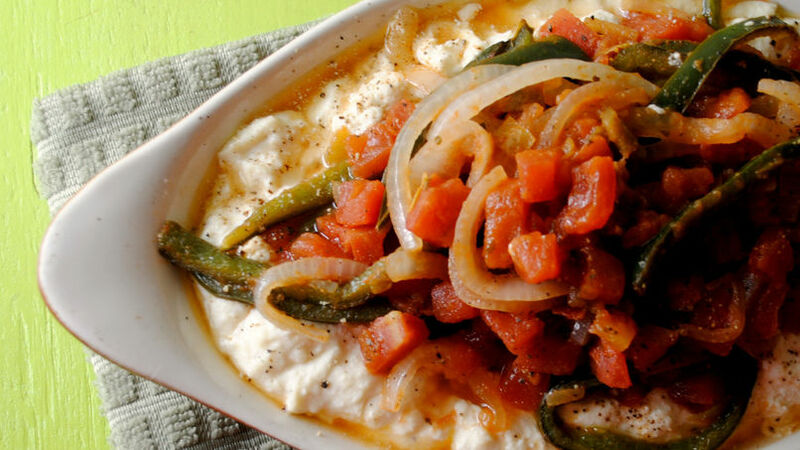 Substitute poblano with red, green or Anaheim peppers. This spicy baked goat cheese dip is a just the thing to enjoy on movie night, game night or girls night in. Creamy goat cheese is spiced up with cumin, red pepper flakes and topped with a poblano tomato mixture and baked until bubbly. Serve with warm bread, pita chips and a few cocktails.